Speedy and easy, this Tortellini Carbonara recipe is a true crowd pleaser. The velvety texture and smoky flavour of this Italian-style dish makes for an excellently rich lunch or dinner. The best thing that you will love about this Tortellini Carbonara is its perfect combination of fats and zest. You can serve it with some freshly baked garlic bread or any of your favorite salad. Try it next time and enjoy! Take a large cooking pot and fill it with tap water. Set the pot on your stove with medium heat and bring it to a boil, keeping it sealed. Once the water starts boiling, add 1 tablespoon of salt into it and stir until dissolved. Add tortellini into the boiling salty water and cook for few minutes or until lightly tender, following the instructions given on its packet. In the intervening time, take a large non-sticking skillet or frying pan and set it on another stove. Set the heat range to medium level and pour 2 tablespoons of extra-virgin olive oil into it. Let the oil warm thoroughly. Now, place the 4 ounces of finely sliced prosciutto in the skillet or pan and fry it for 3 to 6 minutes, changing its sides occasionally. Add 3 finely sliced garlic cloves, 1 tablespoon of tomato paste and ¼ cup of heavy cream into the prosciutto mixture and stir for 3 to 5 seconds to incorporate all the ingredients. Reduce the heat range of the stove to medium-low and cover the pot or skillet by placing its lid at the top. Now let this mixture simmer for the 3 to 5 minutes or until a little thickened and rich. 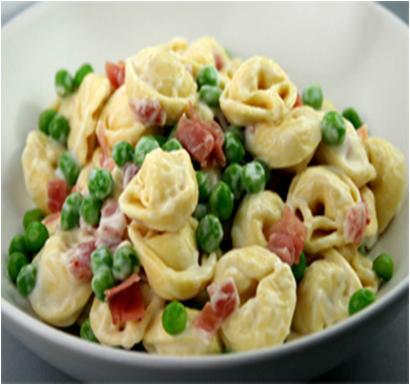 Get back to the tortellini’s pot and add 1 cup of thawed frozen peas to it just 2 minutes before they are cooked. Once the peas are lightly tender, remove the tortellini-pea mixture from heat and strain, using a large colander. Rinse under cold running water for a few seconds and drain again. Now shift the tortellini-pea mixture into the large skillet or pan containing the smooth sauce. Use a large wooden fork or spatula to coat the peas and tortellini with the sauce and cook for 2 more minutes over medium-low heat. Your Tortellini Carbonara is almost ready; remove it from the heat and pour into a large bowl or platter. It is time to garnish it for more a mouth-watering finishing touch. Sprinkle some finely grated Parmesan cheese and fresh parsley over the top and serve immediately. Enjoy!